Wagner Lima died in a motorcycle accident on New Year's Day. His horse, Soreno, attended his funeral and was observed to whimper many times in the funeral procession. When the vehicle carrying Lima's remains came to a stop, Soreno proceeded to smell the coffin and then lay his head upon it. Nonverbal communication is indeed a cross-species phenomenon. With human behavior, as well as with other mammals, touching forehead-to-forehead, temple-to-temple, or eye-to-forehead/temple is a strong signal of affection. 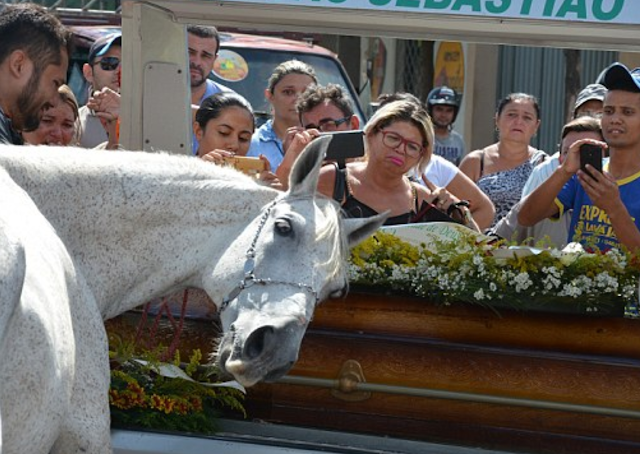 With the touching of the side region of Soreno's head (analogous to the temple area in a human) to Wagner Lima's casket, the horse is a displaying a deep level of emotional affection and connection. Mr. Lima's brother will now be caring for Soreno. "Some creatures have the capacity to fill spaces you never knew were empty."